Keswick MR team joined forces with Cockermouth and Patterdale teams for some joint training in the Cairngorm Mountains near Aviemore, Scotland. 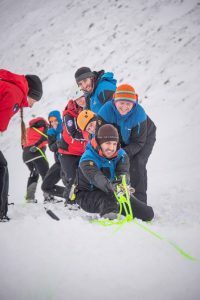 Based out of Badaguish Lodges we had two days of getting our winter skills and avalanche techniques up to scratch before going through some realtime avalanche scenarios. Some new snow had fallen just prior to our arrival which meant the slopes looked white and wintery even if there wasn’t enough snow for avalanches. The first day was based around the Coire na Ciste gully on Cairngorm Mountain where fortunately some old deep snow filled the bottom of the gully. 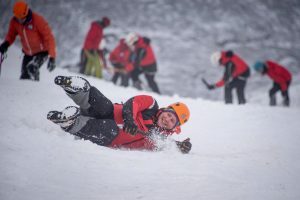 We we’re able to practice safely moving around with and without crampons, ice axe arrests, snow belays and learning about slopes, snow stability, weather and conditions. An informal debrief (!) 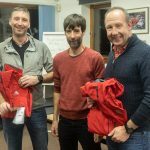 was held in the Pine Marten bar near Loch Morlich. Day two consisted of avalanche specific training with three stations focussing on general scene management, searching using transceivers and poles with the final station dealing with post-avalanche casualty care. With the paucity of snow it was necessary to do a bit of acting but the skills and techniques were practiced enthusiastically by everyone. There was another post-practice debrief session in the Pine Marten Bar! 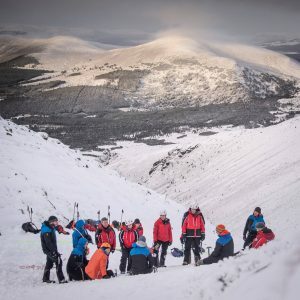 The final day of team training saw the seventy or so team members split into two groups to deal with separate avalanche scenarios. 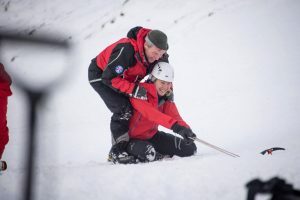 These multi-casualty mock avalanches were run realtime with different people allocated to the various necessary tasks of searching with dogs, hasty search with transceivers, probing and digging teams followed by team members responsible for medical requirements and evacuation. After lunch we swapped scenes and re-ran the scenarios allowing us to change our roles. The general feeling amongst team members was that it was an extremely useful and well run course. The other major plus was the chance to mix and work with other teams. 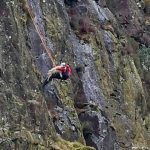 Our three teams cover adjacent patches in the Lakes, and we occasionally meet in passing during a search for example, so it was great to spend time training and socialising together. Have a look at this short video for a better idea.